Mild winters and spring rains and high tides contribute to exploding mosquito populations—and along the Gulf, both of those environmental factors are common. Many Gulf communities, including Daphne, Mobile and Fairhope, are prime mosquito breeding grounds. At Skeeter Solutions, it’s our mission to help local residents enjoy the outdoors without being hassled by these illness-carrying pests. We provide safe, effective mosquito barrier spraying solutions in residential, commercial and municipal areas. Our environmentally friendly mosquito barrier sprays help stop these potentially harmful bugs from biting people and pets. They work around the clock to protect you and your loved ones from West Nile virus, encephalitis and other serious mosquito-borne illnesses. 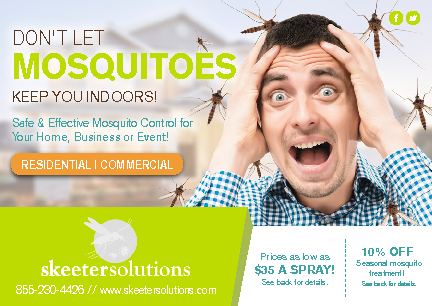 Skeeter Solutions uses mosquito barrier sprays that are non-toxic to humans and pets. The active ingredients we use are commonly found in household pesticides and in lice shampoos for people and animals, and they’re approved by federal regulatory agencies for safety and efficacy. Don’t let the threat of mosquito bites keep you, your kids or your pets inside during beautiful weather. Call Skeeter Solutions to find out how we can help you enjoy the outdoors all summer long. Whether you run a restaurant with outdoor seating , have a play area for kids on your commercial property or otherwise make use of outdoor space for any aspect of your business, you run the risk of mosquito infestation. A mosquito barrier spray from Skeeter Solutions can stop these annoying pests from harassing your guests so they can make good memories—and then come back to make more. Skeeter Solutions uses non-toxic, eco-friendly mosquito barrier sprays to exterminate and repel biting insects on golf courses, athletic fields, community parks and other outdoor venues. Planning a gorgeous outdoor wedding? Throwing a graduation bash? Hosting a family reunion? Don’t let mosquitos rain on your parade. Skeeter Solutions can help ensure your guests have a great time by ridding your outdoor space of biting insects. Animals are susceptible to many of the same mosquito-borne illnesses as humans are, so they deserve the same protections. At Skeeter Solutions, we specialize in providing animal-friendly mosquito barrier sprays in and around livestock grazing areas, feeding areas and barns and stables. We can rid your property of disease-carrying mosquitos so your livestock and horses stay healthy throughout mosquito season. After you’ve set up an appointment with one of our highly trained technicians, we’ll come out to your property and conduct a thorough evaluation. We’ll identify areas that mosquitos commonly use for breeding grounds and find larvae that need to be eliminated. Additionally, we’ll determine how severe your mosquito problem is (and how severe it might become) in order to plan the best course of action. Our technician will then spray a non-toxic mosquito barrier on your property that will kill larvae and adult mosquitos and prevent new ones from setting up shop. Our mosquito barrier sprays are effective for several weeks from the date of application, but they may vary with environmental factors like heavy rain and wind. 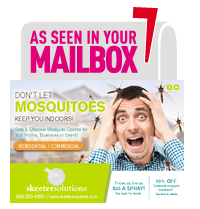 Call Skeeter Solutions at (251) 279-0345 to discover how we can eliminate your mosquito population immediately and stop them from coming back. We’ll be happy to set up an appointment that works with your busy schedule; the sooner you call, the sooner we can send those mosquitos packing.